"The Carnival of Death: Perceptions of Death in Europe and the Americas"--a 3-day exhibition and conference at University College London--launches today! The exhibition features the artwork of Laurie Lipton--who's "Santa Muerte" is shown above, just in time for tonight's event of the same name --as well as that of Matt Rowe, Sarah Sparkes and many more. The conference spans such topics as Helen Frisby's "revelry and rivalry in the nineteenth century English folk funeral," Adriana Bontea's "The Merry Epitaph and the Art of Memory," and our old friend John Troyer's (familiar sounding?) "Morbid Ink: Field Notes on the Human Memorial Tattoo." The exhibition is free and open to the public; Although the interdisciplinary conference is also listed as free and open, registration was supposed to have taken place by Friday February 11th, so not sure if one can still beg their way in or not but, from a glance at the program, thinking it might be worth a try. Kindly sponsored by the John Coffin Trust Fund and the Office for Cultural and Scientific Affairs of the Embassy of Spain in London. In the most general terms death is defined as the final and irreversible cessation of the vital functions in an organism, the ending of life. However, the precise definition of death and the exact time of the transition from life to death differ according to culture, religion and legal system. The essential insecurities and doubts over the nature and state of death have affected cultural production since the beginning of civilization. Likewise our attitude towards death is characterised by anxieties and ambiguities. ‘On the one hand the horror of death drives us off, for we prefer life; on the other an element at once solemn and terrifying fascinates us and disturbs us profoundly,’ writes George Bataille. Death can be ‘a consummation devoutly to be wished’ to say it with Hamlet, or ‘a wonderful gain’ to quote Schopenhauer. But while philosophers and poets explore the dark attraction of death, in everyday life we push all thought of it aside. Death, and above all our own death, must not impinge upon the living. From the beginning of Modernism death and the dying have been pushed from the centre of family and community to the edges of society. The hygienic, clean and sterile spaces of hospitals, hospices and morgues have replaced the intimacy of the home, while cemeteries have been moved from the centre of town to the outskirts. The progress in medical science has lead to an increase in life expectancy in the Western world resulting in an ever ageing population – it seems as though we have almost found a cure for death. Medical apparatus now allow us to keep a body alive and prolong physical existence even after the brain has died – but what then does it mean to be human and how can we die in a humane way? Recent cases of assisted suicide of terminally ill people have sparked off discussions in the UK around the right to die and the dignity of death. Meanwhile changes in religious believes and practices are turning ancient traditions into commercial enterprises and festivities such as Halloween parties or Mexico’s Día de los muertos or Rio de Janeiro’s carnival , which are marketed as major tourist attractions. Western societies no longer have the time or the space to mourn as they used to. Rather the public mourning and posthumous apotheosis of celebrities such as Princess Di or more recently Michael Jackson appear to have taken the place of the private. Here mourning has become public spectacle, international and accessible to all via TV, Youtube, Facebook and Twitter. This conference sets out to look at death in the contemporary world and how changes in society since the turn of the 19th century have affected our perceptions of death. It consists of three broad themes which interconnect with each other: Death and Desire; Death and Power; and Rituals and Customs. We invite papers from a wide variety of disciplines and approaches such as: anthropology, art history, cultural studies, film studies, fine art, history, law, literary studies, philosophy, psychology, theology, etc. F0r more info, and a full line-up, click here. To download the exhibition catalog, click here. Thanks to participant John Troyer and blogger Suzanne G for alerting me to this event. 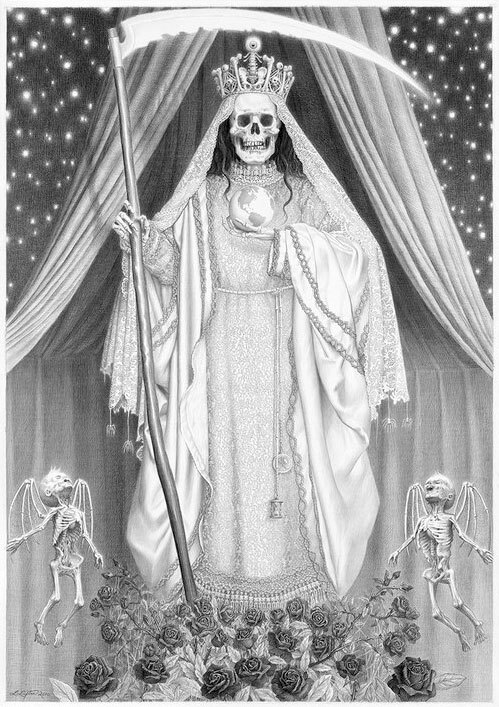 Image: Santa Muerte by Laurie Lipton, charcoal & pencil on paper, 2011; click view larger, more detailed version.